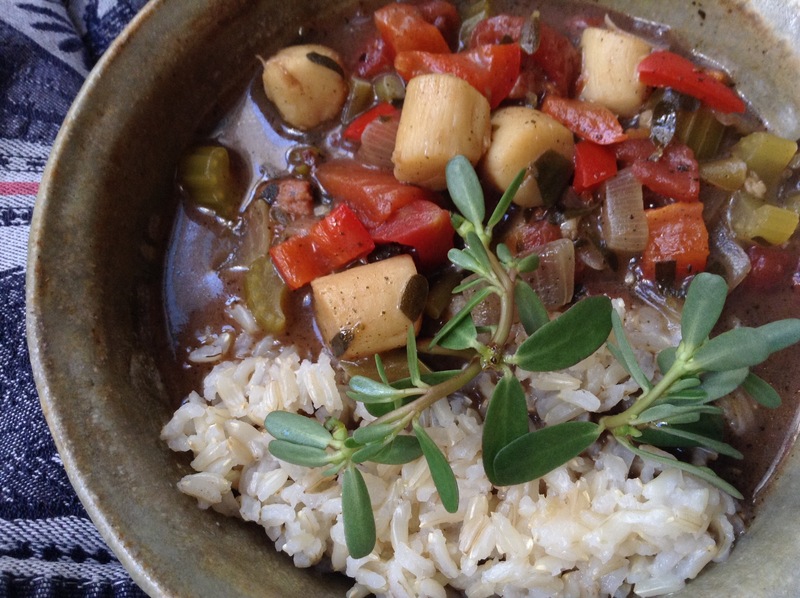 Here’s a recipe that replaces the usual okra in Creole-style gumbo with wild purslane. “Wild” is relative – purslane is probably growing in your backyard or neighborhood park right now. And filé powder is simply dried, powdered sassafras leaves (you can make your own if you live in sassafras’s range in mid to eastern North America. If not, go ahead and try the recipe without. It will still be good). I once saw purslane for sale at $7 a bunch. Maybe I should go into the purslane business because I collect ample amounts of this ubiquitous “weed” for free. Purslane, a.k.a. Portulaca oleracea, is a low-growing plant with thick, reddish, succulent stems and shiny leaves that are broader at the tip than the base. It resembles a miniature jade plant. It has small yellow flowers that turn into tiny capsules filled with many seeds. The seeds are edible, but a hassle to collect. It’s the leaves and stems that are the main harvest. You can eat purslane leaves and stems raw or cooked — the fat stems make good pickles and relish. The plant has a lightly tangy, sour taste. But what interests us for gumbo purposes is that it is also mucilaginous. That’s what makes it perfect for replacing the okra that is in traditional gumbo. An added perk of purslane is that it contains healthy omega-3 fatty acids just like fish does. Novice foragers beware: there is a poisonous plant called spurge (Euphorbia maculata) that likes similar sunny, disturbed soil habitats and is sometimes confused with purslane. To be certain you’ve got the right plant, snap a stem. 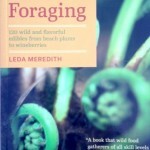 Spurge will ooze a white latex and purslane will not. Sassafras (Sassafras albidum) is a native North American tree. The roots and bark have a distinct scent of root beer, and indeed in the past it was used to make real root beer. But for gumbo, it’s the leaves that we want. Sassafras leaves come in three different shapes all on the same tree: a simple oval, a 3-lobed variation, and a 2-lobed mitten shape. Mulberry leaves can also have all three leaf shapes on one tree, but mulberry leaves have toothed margins and sassafras leaf margins are smooth. Filé powder is the dried, finely ground leaves of the sassafras tree. It is added at the very end of gumbo making, after the heat is turned off. Along with the okra (or in my version, purslane) and the classic roux, the filé powder helps to thicken the gumbo. It also adds a subtle and unique seasoning. The homemade version is much more aromatic and flavorful than any of the commercial versions. Make a big pot of rice to serve with this wild gumbo. In a Dutch oven or other heavy pot, heat the oil over medium heat. Whisk in the flour. Stir constantly with a wooden spoon until the roux is a rich brown color. Remove from the heat and let cool for 1 minute. Add the onion, bell pepper, celery, and hot peppers. Return to the heat. Whisk in the stock and tomatoes. Bring to a boil over medium high heat, stirring constantly. Reduce the heat to medium. Add the purslane, sausage and garlic. Simmer until the vegetables are tender, 10 – 15 minutes. Add the scallops or shrimp and cook for 5 minutes more. Turn off the heat. Stir in the filé powder and salt to taste. Serve over cooked rice. Vegan Variation: leave out the sausage and seafood, add 1 cup cooked beans, substitute 1 – 2 chipotle peppers in adobo for the hot chilé peppers.